Music is like a woven tapestry. It has rich silk jewel tones, rough tufts of earthen fibers. A decent chamber composition is gentle enough to separate as you listen, a little crochet hook in your mind lets a special passage flow through your deepest emotions and evoke long unvisited memories. At least I thought that I understood music this way — and then I listened to some pieces by the British composer, Thomas Adès. 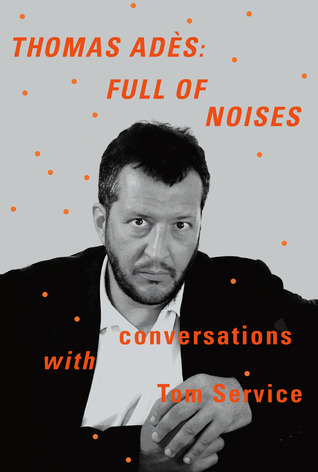 Adès is a forty-something artist who has shared his love story with the expression of sound in his book, Thomas Adès: Full of Noises: Conversations with Tom Service by Thomas Ades, Tom Service. I’ve put the book on my wish list so that I can eventually write a serious review of it. Will I be convinced that there is purpose and meaning behind works that alternately sound like Mozart gargling with sand and a kitten singing in the dryer on a gorgeous autumn day? As it turns out, there is a stately, surefooted beauty to that sort of thing. Adès’ violin concerto, Concentric Paths, seems like it would be particularly amazing to play. I’ve listened to some recordings of it, and they were surprisingly very differently interpreted. I think there is always going to be room for a fresh take on it. I’m not quite so sure I could sell my chamber orchestra friends on it, but stranger things have happened.